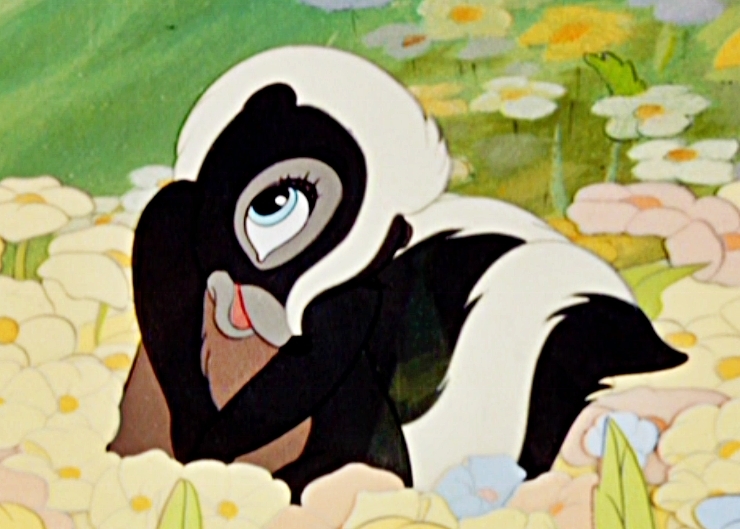 Before heading out on a Disney trip, I like to take tie to rewatch some Disney animated films. This gets me in the mood for the parks, and also reminds me of the characters I’ll see and the songs I’ll hear. 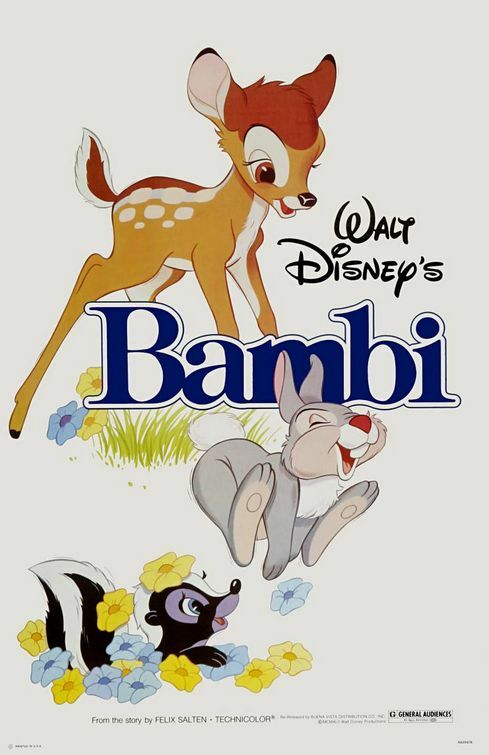 One of the films I just watched is Bambi, an endeavor partly inspired by the recent PBS biography of Walt Disney. It’s one of the classic films, something he had a hand in, and, because of that, special. Watching it now, there are definitely things I appreciated about it. The animation is lovely, and I got the same delight out of young Bambi tangling up his gangly limbs when Thumper teaches him to hop as I did when I was little, and I didn’t remember the scene of Bambi running through the snowy woods looking for his mother being quite so eerie. There are some classic quotes from that are just associated with the Disney brand (“Man is in the forest.”), and the owl gave us the word twitterpated! And of course, there’s Flower. How can you not love flower? Still, while I appreciate it, I don’t love Bambi. The story jolts for me, jumping from one season to the next, and aside from the fire and the escape from the hunters at the end, there’s not much in the way of danger or drama, to keep really grab me by the ears and make me pay attention. It’s a sleepy film, and while that’s not always bad, it doesn’t have much of an effect on me here. I’ll likely see this movie again, watching parts of it when it appears on TV, or sitting with my hypothetical future children when they watch it — because anyone who grows into a Disney fan, or more broadly an animation fan, should see it. But it’s certainly not one of my favorite films. What other Disney films should I watch? I recently played Lilo & Stitch (maybe I’ll write a post about that) and I’ve got a rented copy of Snow White waiting to be watched. And I have to watch Lion King before I go. I have to. But what else can I squeeze into 2 and 1/2 weeks?